The massive air time and amazing tricks make snowboarding a crowd favorite at the Winter Olympics. This homegrown, American sport combines the body style of surfing with the acrobatics of skateboarding. Snowboarding is relatively young sport. The sport was created in the late 1960s and the first competition wasn’t until 1981. Despite this, it has spread throughout the world and is quickly becoming one of the most popular events of the Winter Olympics. This is the poster-child event of snowboarding. Competitors take turns tackling the half pipe, a long half-cylinder covered in snow and ice. Each competitor launches himself over the edge of the pipe and propels himself across the half pipe in such a way to shoot way over the edge of the other side. 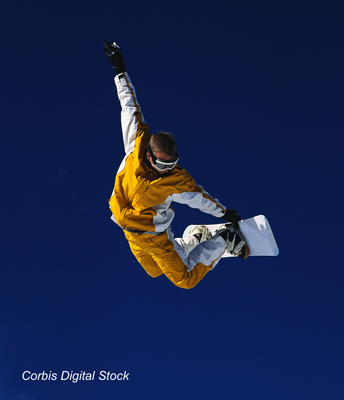 While the snowboarder is in the air, he performs death-defying stunts involving flips and spins in various arm and leg positions. Snowboarders continue this in a back and forth pattern, down one wall and up the next, as they make their way down the half pipe. The sharp edge of the half-pipe itself combined with the nature of the stunts makes the half pipe one of the most dangerous of all the Winter Olympic events. In fact, one of the U.S Olympic hopefuls, Kevin Pierce, experienced a devastating head injury just weeks before the Vancouver Olympics. Parallel giant slalom is a speed race — or rather, several races. The top competitors need to make it through nine rounds altogether. The competition starts off with several rounds in which the racers are simply racing against the clock. Once the field is narrowed down to the top 16 competitors, they tackle the giant slalom course in head-to-head, side-by-side competition. Like slalom events in the skiing competition, the racer must weave his way through a course full of gates and tight turns. Each of these head-to-head rounds consists of two runs. After the first run, the racers swap sides to ensure that all is fair. The run times are combined and the fastest time wins. If a snowboarder misses a gate, falls, or doesn’t finish the first run, he receives a time penalty. He will then have to bring in a substantially better time than his opponent in the second run to move on to the next round. If a snowboarder experiences one of these faults on the second run, he automatically loses the heat. If both snowboarders fall during the first run, they can get up and continue. The snowboarder who comes in first is the winner of that run. If they both fall in the second run, whoever got through the most gates is considered the winner of the heat. This is a mass start event in which 4 racers start at the same time. They must make their way through an obstacle course full of hills, turns, jumps and ramps. They can do tricks, but too many tricks will just slow them down — and this is a timed race. The best two times move on to the next round. Like Eskimos, snowboarders have many different ways to describe snow conditions: freshies, hard pack, boilerplate, mashed potatoes, hero snow, pow pow, and hot pow.